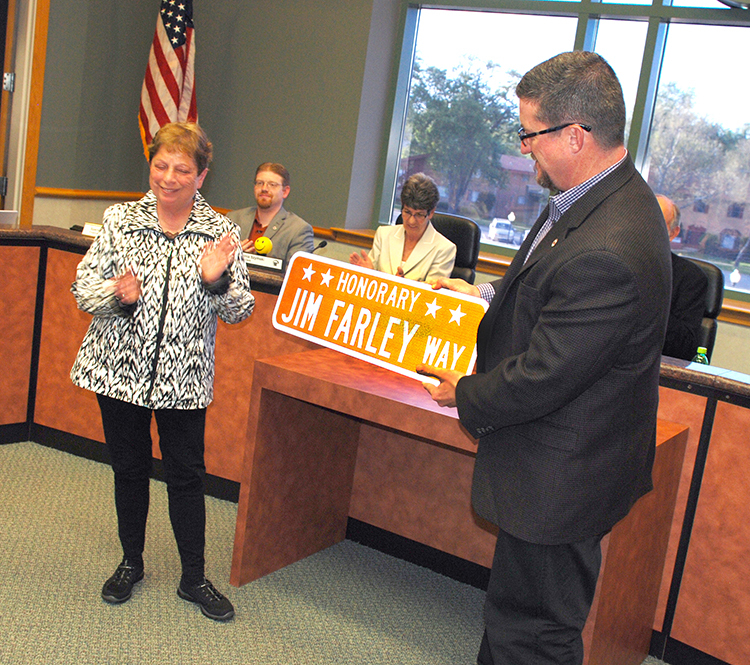 At their May 12 meeting, the Westmont Village Board unanimously approved the honorary street dedication of Jim Farley Way on Park Street, south of 55th Street. The dedication was in honor of former Westmont Police Detective/Sergeant Jim Farley who served the department for 26 years. Farley was also a Veteran who served 3 tours of duty in Vietnam. Farley passed away on December 13, 2015 after a long battle with cancer. “This means a lot,” said Joanne Farley, Jim’s wife. “It’s an honor. I didn’t think anything like this would happen. I want to thank my neighbors and Trustee Harold Barry for making this happen.” More than 40 neighbors and family members attended the Village Board meeting in support of the dedication.